The Aqua Resort, Busselton. 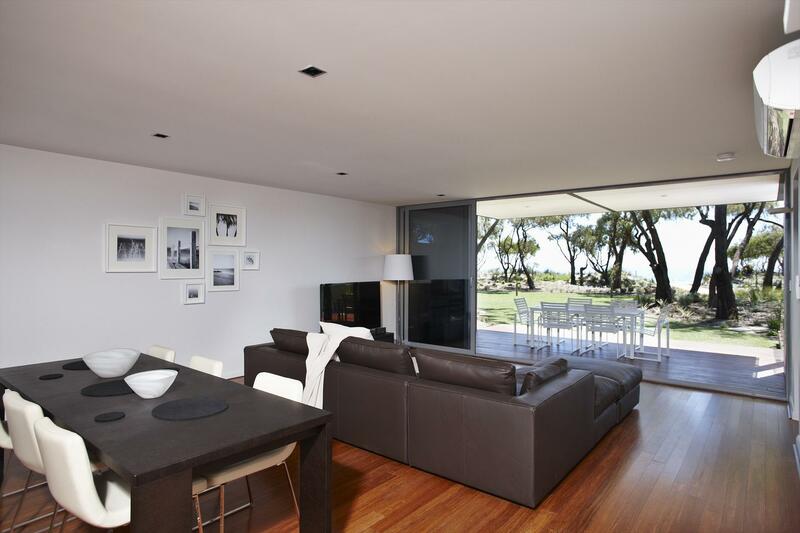 Understated luxury on the shores of the pristine protected waters of Geographe Bay, Western Australia. Nestled on the calm tranquil waters of Geographe Bay and set amongst a grove of pepermint trees and beautifully landscaped gardens, The Aqua Resort offers world class facilities, including a 25 metre lap pool & Spa, surrounded by timber decking with sweeping ocean views, a well equipped Gymnasium, Sauna and Tennis court. Choose from either an exclusive Bay Beach House that enjoys direct beach frontage, breath taking views of the bay and Cape Naturaliste, or an immaculately finished Grove Beach House privately nestled in the cool confines of the Peppermint trees. 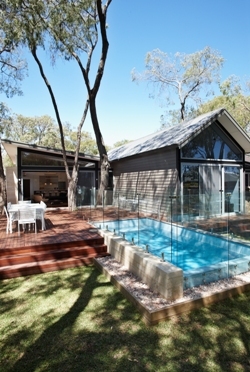 The Grove Beach house offers 4 bedrooms with 3 beautifully appointed bathrooms. The Grove can easily accommodate up to 10 guests but also able to be keyed to 2 bedrooms and 2 bathrooms for a more intimate stay..
With luxury furnishings, modern finishes and state of the art media technology through out each Beach House, we offer the best of indoor / outdoor living. To further indulge, several Beach Houses include private heated plunge pools. Aqua Resort is also the perfect location for your wedding. With a beautiful water front location, grassed and landscaped gardens under the shade of mature peppermint trees; ideal for a picturesque marquee style wedding. With the convenience of local restaurants, wine bars and grocery store within a leisurely stroll along the beachfront walkway. The Aqua Resort is located just minutes from all that the beautiful South West has to offer. 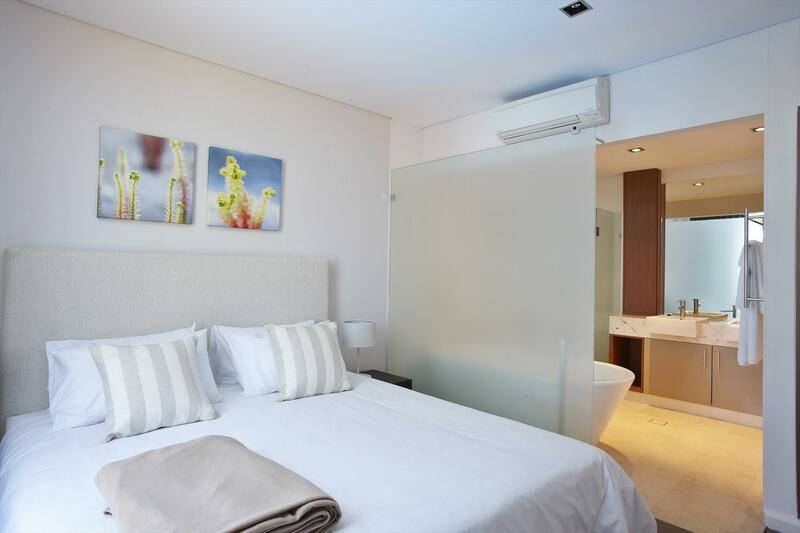 Upstairs apartment with one bedrooms, perfect for 2 guests with one king bed. One well appointed bathroom. Direct beach frontage. Gourmet Kitchen, gas fire place, full reverse cycle air-conditioning and open plan living area with TV, Foxtel, DVD, stereo and iPod dock. Laundry facilities. Balcony with ocean or pool views and a barbeque. Please note there is no outdoor shower. Downstairs apartment with two bedrooms, perfect for eight guests with one king bed, two bunk beds and two trundle beds. Two well appointed bathrooms. Direct beach frontage. 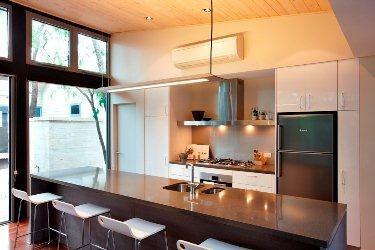 Gourmet Kitchen, full reverse cycle aircondlting and open plan living area with TV, Foxtel, DVD, stereo and iPod dock. Laundry facilities. Deck area with ocean setting, lawned area, outdoor shower and a barbeque. Private plunge pool, gas heated to 28 degrees. Please note this apartment does not have an open gas fire. Upstairs apartment with three bedrooms, perfect for six guests with two king beds and two king singles. Two well appointed bathrooms. Direct beach frontage. Gourmet Kitchen, gas fire place, full reverse cycle aircondlting and open plan living area with TV, Foxtel, DVD, stereo and iPod dock. Laundry facilities. Balcony with ocean views and barbeque. Please note there is no outdoor shower. Two storey five bedroom beach house, perfect for up to 14 guests. The property includes three king beds, two king singles, two bunk beds and two trundle beds. Four well appointed bathrooms. 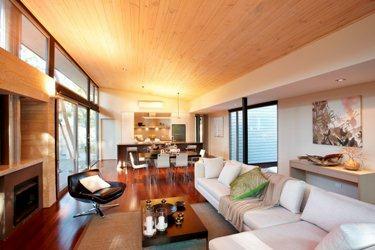 Two gourmet kitchens, open plan living areas with TV, Foxtel, DVD, stereo and iPod dock. Gas fire place upstairs and laundry facilities. Direct beach frontage, balcony with ocean vies and lower deck with ocean views, lawned area and barbeque. Outdoor shower, private heated plunge pool (gas heated up to 26 degrees). 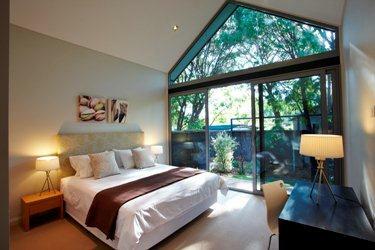 The Grove one bedroom house is perfect for 2 guests. Comfortable King bedroom with a well appointed bathroom. Gourmet kitchen, open plan living area with TV, Foxtel, DVD, stereo and iPod dock. Full reverse cycle air conditioning. Gas fire place. Outdoor shower. Landscaped garden setting with private decking and barbecue. The Grove House two bedroom house, perfect for up to six guests. 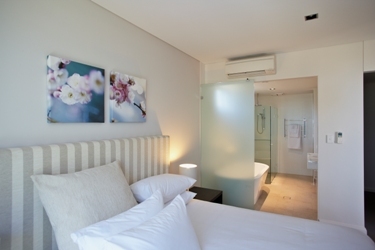 Guests have a choice of two king beds and two singles, or one king bed, two king singles and two single bunks. Please note: guests must specify if they require the use of the bunk rooms at time of booking, if not requests are made, the bedding will default to two kings and two singles. Two well appointed bathrooms. Gourmet kitchen, open plan living area with TV, Foxtel, DVD, stereo and iPod dock. Full reverse cycle air conditioning. Gas fire place. Outdoor shower. Landscaped garden setting with private decking and barbecue. The Grove House three bedroom house, perfect for up to eight guests. Two kings, and two bunk beds. Three well appointed bathrooms. Gourmet kitchen, open plan living area with TV, Foxtel, DVD, stereo and iPod dock. Full reverse cycle air conditioning. Gas fire place. Laundry facilities. Outdoor shower. Landscaped garden setting with private decking and barbecue. The Grove House four bedroom house, perfect for up to ten guests. Two kings, two king singles and two bunk beds. Three well appointed bathrooms. 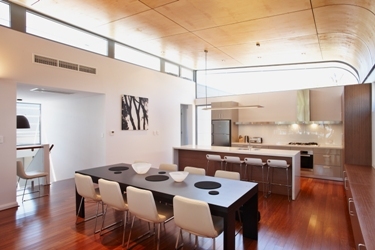 Gourmet kitchen, open plan living area with TV, Foxtel, DVD, stereo and iPod dock. Full reverse cycle air conditioning. Gas fire place. Laundry facilities. Outdoor shower. Landscaped garden setting with private decking and barbecue. Two bedroom house with a choice of two kings or a king and two singles or a king and two sets of bunks, perfect for up to six guests. Two well appointed bathrooms. Gourmet kitchen. 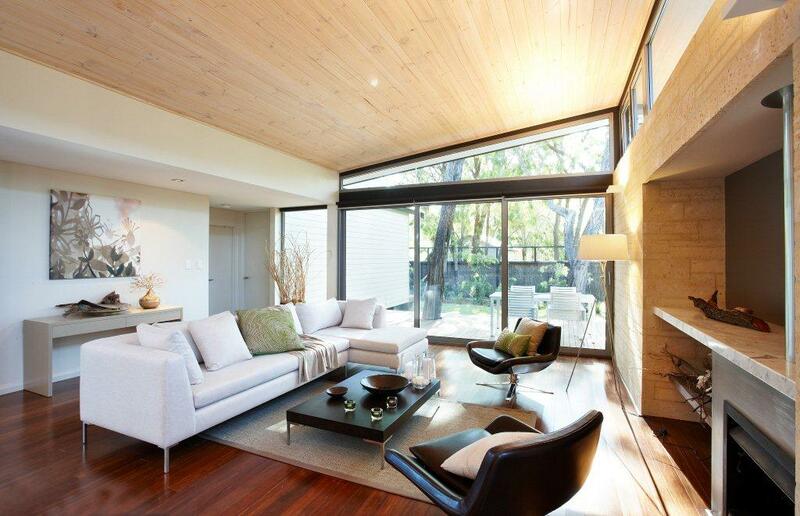 Open plan living area with TV, Foxtel, DVD, stereo and iPod dock. Full reverse cycle air conditioning. Gas fire place. Landscaped garden setting with private decking and barbeque and private plunge pool on the deck (gas heated up to 26 degrees). Please make bedding configuration preferences known to management at time of booking. Three bedroom house with two kings and two bunk beds, perfect for up to eight guests. Two well appointed bathrooms. Gourmet kitchen. Open plan living area with TV, Foxtel, DVD, stereo and iPod dock. Full reverse cycle air conditioning. Gas fire place. Laundry facilities. Landscaped garden setting with private decking and barbeque and private plunge pool on the deck (gas heated up to 26 degrees). Four bedroom house with a two kings, two singles and two bunk beds, perfect for up to ten guests. Three well appointed bathrooms. Gourmet kitchen. Open plan living area with TV, Foxtel, DVD, stereo and iPod dock. Full reverse cycle air conditioning. Gas fire place. Laundry facilities. Landscaped garden setting with private decking and barbeque and private plunge pool on the deck (gas heated up to 26 degrees). Cancellations must be made at least 3 days prior to arrival date to avoid a cancellation penalty of full amount of accommodation. Early departures whilst in house are non refundable. Peak Period Cancellation Policy is that cancellations must be made at least 21 days prior to arrival date to avoid full amount of accommodation charge. PEAK: January December and Easter weekend.